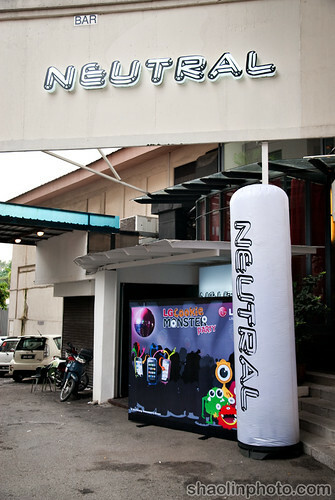 So Nuffnang held another happening event this past weekend, this time it was at Neutral Club in KL (just below Grand Modesto’s) at Jalan P.Ramlee. 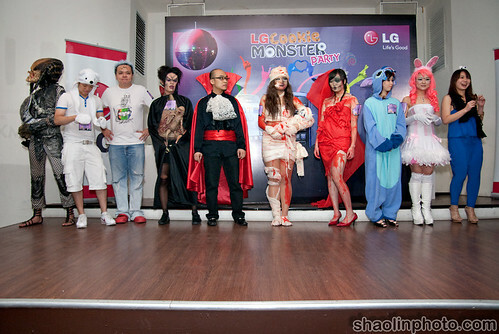 The event this time was the LG Cookie Monster Party in conjunction with a new range of Cookie phones launched by LG. The theme was of course MONSTERS, but more towards the cute fluffy kind – rather than the scary monster kind…but as always we ended up with both kinds 😀 And the nuffies looking stunning in all white! 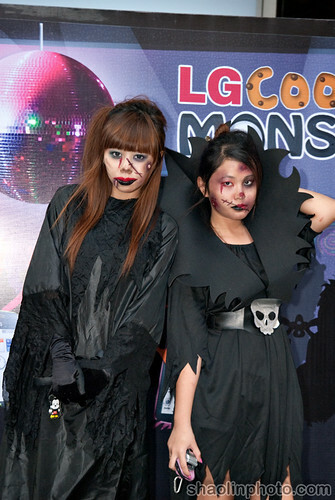 And of course both CUTE monsters..
And the scary one were REALLY scary.. I mean just check out this freaky baby thing on the dudes stomach. 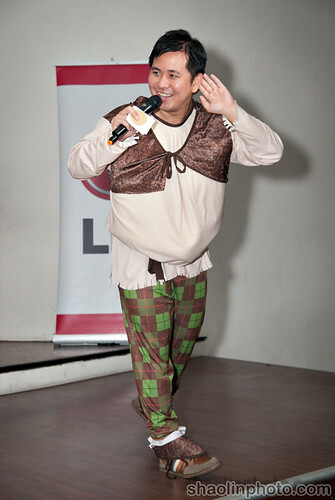 Shrek Kenny Sia was the emcee for the event, he did a great job! There was a good turn-out and as is normal with Nuffnang parties, everyone was very sporting and got into the spirit of things. As for the name of club, Neutral – it comes about because the interior is very neutral, mostly white in fact. 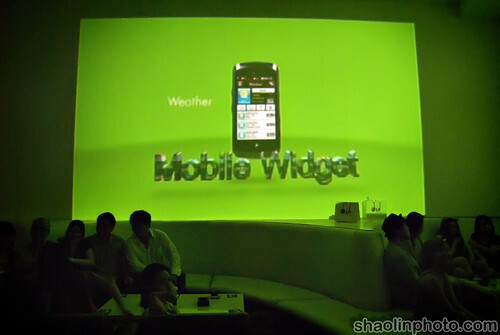 Any branding/decor is simply projected onto the walls to give relevance to the event. A pretty neat idea, but near impossible to capture on a photograph. I did manage to capture it once during a video presentation, but during normal shots you just can’t see what is on the walls in photos. 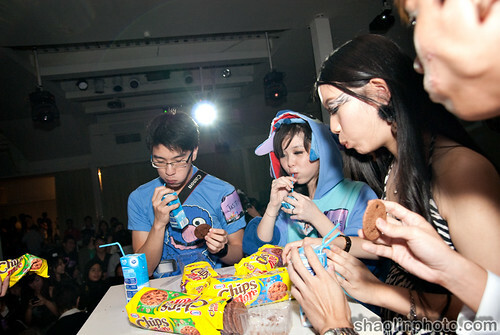 One of the most fun parts was the cookie eating contest, I almost wished I could enter..but seeing the speed these chaps polished off the entire pack, I fear I would have been defeated anyway. Of course the main event, which everyone was waiting for, was the Nuffies performing the Wondergirls – Nobody dance and they did a fantastic job! Then there was some kinda auction thing where people had to bid the LG Cookie currency for a chance to eat a cookie topped with some random stuff, after that they won a prize. There was a lot of hoarding and pooling going on. Then the main event, the best dressed male and female! Here are all 10 finalists (top 5 male and top 5 female) for the best dressed. 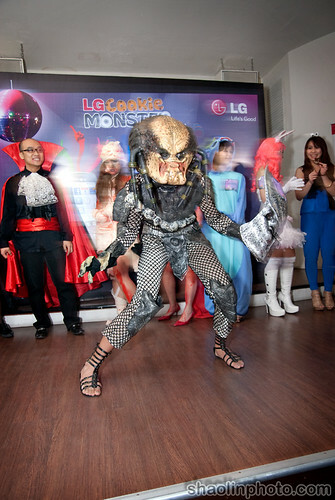 As soon as I saw this chap in his awesome Predator costume I had a feeling he may well win, and I was right – because he did! 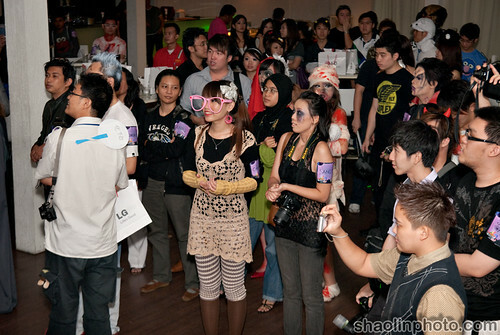 The female winner was Coco with her zombie kinda thang going on. 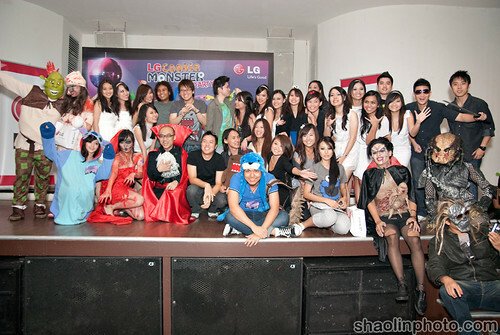 And of course the customary group picture to end with all the nuffies, the winners and some other random folks who jumped in. 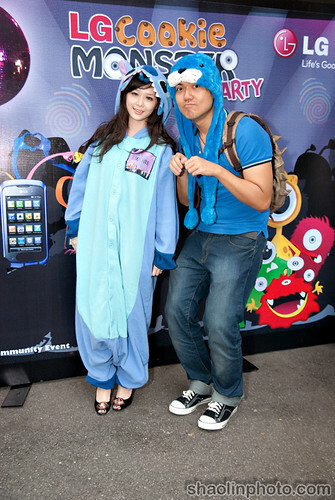 wah the nuffies memang damn hot dot com, look at actorina all! KY: Yah damn hot wei!